Growing up in Turkey, Ali Erdemir and Osman Eryilmaz would sometimes play with the borax deposits near the mountains by their homes — but only later would they discover that borax would underlie one of their crowning achievements as scientists. Erdemir and Eryilmaz are part of a team of researchers at the U.S. Department of Energy’s Argonne National Laboratory who recently won an R&D 100 Award for a technology that rapidly converts metallic surfaces into a hard, durable boride layer. Large-scale ultra-fast boriding can be used to enhance the strength and performance of metal or alloy mechanical parts. Researchers Greg Krumdick, Osman Levent Eryilmaz and Ali Erdemir stand in front of the large-scale ultra-fast boriding furnace, which rapidly converts the surface of metal or alloy mechanical parts into a hard, durable boride layer. At full capacity, the furnace can treat millions of industrial parts per year. Compared to conventional boriding, the new technique substantially cuts down on time, energy and money. Boriding itself is not a new surface hardening technique. Conventional pack-boriding, which is both labor- and energy-intensive, works by holding industrial parts in a powder mix at high temperatures (1000°C) for 8 to 12 hours. Large-scale ultra-fast boriding, as its name suggests, can achieve the same boride layer thickness in 15 minutes. Furthermore, it produces a denser and more uniform coating, successfully treats a wider range of metals and requires 85 percent less energy and money than conventional boriding. For primary investigator Erdemir and his research team, the end product was more than they hoped for. Over three years, the scientists scaled their ultra-fast technique up to industrial production capacity. Along the way, they collaborated with Bodycote, the world’s largest boriding service provider, and researchers at Istanbul Technical University. Their work culminated in the successful operation of a custom-built industrial-scale furnace, which acts like a fondue pot by holding a molten borax-based solution into which metal pieces can be dipped. Large-scale ultra-fast boriding employs an electrochemical process similar to that of batteries. Each electrochemical cell contains a positively charged cathode, negatively charged anode and a borax-based electrolyte. Samples to be borided are attached to the cathode. When the unit is connected to a power source, ions flow from the anode to the cathode, depositing boron on the cathode and attached workpieces. Argonne postdoctoral researcher Vivekanand Sista helped develop the boriding technology. 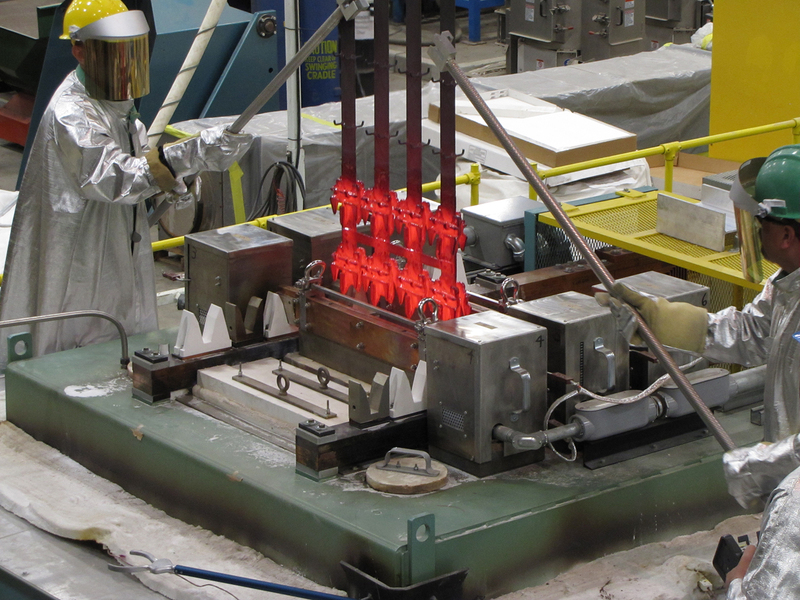 The furnace has three cathodes and four anodes, and holds more than 8,000 pounds of electrolyte. At full capacity, it can treat millions of industrial parts per year. ​“The unit is one-of-a-kind, containing eight layers and various chambers. It was the major innovation of this project,” said Eryilmaz, who supervised the process. It took the scientists several months just to find the correct materials to construct it. The underlying electrochemical mechanism is what puts the ​“ultra-fast” in large-scale ultra-fast boriding. While conventional pack-boriding is limited by the diffusion of boron onto the metal surface, large-scale ultra-fast boriding supplies copious amounts of reactive boron to the surface of workpieces in a short amount of time. Since the process takes minutes rather than hours, it can form thick, dense boride layers that do not crack and chip while boriding takes place. Though large-scale ultra-fast boriding works best for iron- and steel-based parts, its speed also allows for the treatment of non-ferrous metals and alloys that are outside the range of conventional methods. The process produces a boride layer that adheres strongly to the base metal and does not come loose with extreme use, as is sometimes the case with other types of coating. It also extends the life of metal parts, so they need to be replaced less frequently than they would with other coating processes. The researchers believe that their technology can transform boriding from a niche process to one that replaces or complements the most commonly-used surface engineering and treatment processes. ​“Large-scale ultra-fast boriding can meet the increasing demands for green, cost-effective and large-volume applications in the transportation, manufacturing, aerospace, agricultural, mining and oil-exploration sectors,” explained Erdemir. At 18 cents to produce a 100-micrometer thick layer on one pound of steel, its cost is lower than that of all major competing processes, which start at 34 cents for the same amount of coating. Large-scale ultra-fast boriding has the least environmental impact of its competitors. It has the highest energy efficiency and in many cases saves 80 to 90 percent of the energy used in other processes by eliminating a substantial amount of time and treatment steps. Furthermore, it does not generate any in-house greenhouse gas emissions, unlike other processes that produce large amounts of CO2 and other gases, nor does it produce solid or liquid wastes. The process is much cleaner than pack-boriding, which uses complex powder mixes that give off hazardous emissions and therefore must be replaced with every boriding run. Large-scale ultra-fast boriding uses the natural mineral borax as its boron source. As a result, the electrolyte in the furnace never needs to be discarded, only replenished when it runs low. For pack-boriding, workpieces must undergo grit-blasting or abrasive grinding to remove adhering powders. Because borax is non-toxic and water-soluble, workpieces treated with large-scale ultra-fast boriding need only to be rinsed in water for residue removal. Furthermore, applications of large-scale ultra-fast boriding could yield tremendous environmental benefits. Because the technique creates extremely uniform layers, it could be used to manufacture wear-resistant, low-friction bearings and gears for wind turbines or engine parts that increase the fuel economy of automobiles. Large-scale ultra-fast boriding can also treat agricultural, mining or earthmoving equipment that come in frequent contact with dirt, rocks or minerals. Other applications include orthopedic implants, mechanical seals for industrial pumps, pipes and even armor — the possibilities are countless and wide-ranging. Currently large-scale ultra-fast boriding can only occur at temperatures above 750°C. Erdemir and his team are working on an electrolyte that operates at temperatures below 500°C. A lower-temperature operation would extend the range of metals that can be treated to include aluminum and a few other non-ferrous materials like magnesium, brass and bronze.